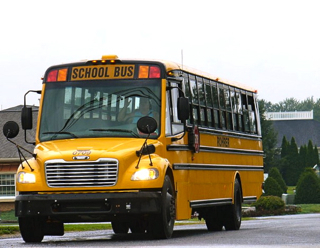 Love That Max : Kids with special needs abandoned on school buses: Why is this happening? This is outrageous! My sister quit her job as a bus driver for special needs kids a few years ago when she discovered that her aide was hitting one child with the seat belt buckle to keep him in line. She also said that drivers and aides were not trained and were not permitted to know anything about the children's disabilities. I don't know how anyone else feels, but I would want everyone who comes in contact with my daughter to know she has seizures. I guess it's the parents job to make sure that everyone does! And stuff like this is why we have opted not to have Matthew bused to school when he starts Pre-K next week. He's non-verbal, he has meltdowns that lead to breath holding spells and absence seizures, and I have heard worse stories in our state (FL) of abuse and even the death of a child a few months ago. My son can not speak and the school almost put him on the wrong bus at the end of the day. Then (since his bus had already left) it was up to me to leave work and go to get him. We are very lucky to have had the same wonderful driver and aide for 3 years. Earlier this year she was sick and they did not even bother to find her a replacement. Nobody got picked up for 3 days! She felt horrible but had assumed they would replace her for those days. Buses are terrible but as a working mom I don't have a choice. Ohhh... let me tell you about the time I almost went to jail for assault - otherwise known as the day the substitute bus driver told me to calm down. :-) I live 10 minutes from the school. My daughter got out at 3:20 and usually dropped off at 4:00 - 4:10. She loved the bus, not a problem. On this day at about 4:20 I started to wonder. 4:25 - worry, 4:30 - called transportation. They tell me there's a new driver, be patient. Ok. Give directions. (It's not that big of a school district. We live in a small neighborhood, roads clearly marked, etc) 4:40, call again. New driver can't find your house, but she's right around the corner. 4:45 - stand oustide. 5:00 finally see bus coming down my street - stopping at every house as my son and I wave our arms. Ummm.... my daughter is the only one on the bus. 4 houses down...we're waving, 3 houses, 2 houses....helloooo- we are heeeerreeee!!! Bus stops. My daughter races off into the house and the bus driver gets up out of her seat to come down the stairs and yell at me for 'panicking'. I yelled at her for not calling to let me know what was happening. She yelled back that drivers were not allowed to call parents and she was new and I shouldn't cause problems and who did I think I was, geeeezzz. I screamed at her YOU HAD MY KID FOR ALMOST TWO HOURS AND NO ONE KNEW WHERE YOU WERE- HELLO? The aide kept apologizing profusely. The driver apologized after I complained and tried to get her fired. I was assured she wouldn't be driving a bus anymore. This is not just an issue for special needs kids. Every summer you hear of at least one or more incidents where a child dies of heat because he or she was forgotten in a car by a parent or bus driver. I am a public pre-k teacher in Alamance County, North Carolina. We are required to track our students' every movement. We have a checklist and we have to write where we are going, and then record what time we leave our room, arrive at said place, leave said place, and return to our room, as well as check off each student with us, and write in if students are absent/with specialists/etc. Sometimes it feels excessive but every student is accounted for at every second of the day, and my initials are on every single transition so I am held accountable if someone goes missing. I don't see how this isn't required for special needs classroom teachers, specialists, and bus drivers. This would be particularly easy for bus drivers, since there are only two transitions each route - on the bus and off the bus. Any idea who we could write to in our states to suggest something like this? The frequency with which this occurs is unbelievable...and totally unacceptable. Jesus, how hard is it to make a checklist? And it's not like they're huge full buses! In this district (and probably elsewhere), the same bus drops kids off at multiple schools in our part of town, making it doubly easy to make this kind of error, particularly with subs or staff who are new to a route. Yikes! I can't imagine what I would do if I was left behind somewhere seeing as how I can't walk. Scary stuff! Once my daughter was dropped off at the wrong school but luckly the aide greeting the children did not reconize her called DOT and she got to her school. Appartently it was a subsitute aide but still she has a LARGE TAG with the name of her school on it. This was 5 years ago and we have since moved. Our new DOT is great making sure she is safe and at school. Eliza has autism and can talk but not always in a way that makes complte sense. Dear God. As a Canadian (with autism), I am glad that it doesn't happen (really), especially in Saskatchewan. The fact that south of the border, this keeps happening like doors being slammed over and over again, shows that Canada is better than the America, in regards of it. So, to quote Tooner, "come to Canada." No, come to Saskatchewan. You might want to bring some heavy coats though, but it is the price to pay for better service and quality, as well as treatment. Great timing on this post - you read my mind. I am a special education teacher and THE most stressful part of my day is drop off/pick up because of all the busing issues. I feel like it has been getting worse, actually. Last week a sub for one of the bus aides left one of my students (who is low verbal and spanish dominate) on the sidewalk. I can't walk every single bus route out to the bus because my students are on 8 different buses. I had a heart attack and needless to say let the bus aide have it. The biggest problem my school has is with subs for the regular aides/drivers. These people are not trained, not knowledgeable, and for some reason do not ask any questions or for help. I have been filing complaints with the bus company after each and every incident. It is disgusting that these issues continue to happen. Thanks for raising awareness about this serious issue. Why the heck does this happen? This is scary and yet so easily prevented. Like you mentioned a headcount or a daily checklist to check off each child as they depart from the bus and I agree that the bus aids need to be trained accordingly. This situation is completely out of hand.